I know Christy isn’t the only one with this dilemma – isn’t it crazy how popular those brass fire surrounds used to be? We had a similar surround on our fireplace before we demolished and rebuilt the whole thing because of some crazy, shiny stone. 2. Unscrew the fireplace surround from the fireplace. There should be screws holding the surround into the fireplace – just find them and unscrew the whole shebang (and be sure to hang onto your screws). 4. Let it dry. Although spray paint dries pretty quickly, try to give the trim and doors at least a day to dry before you put them back up just to be safe. Once the trim and doors are dry, find your screws and put those babies back in place! 5. Brag a little. Your friends will be totally jealous that your fireplace now looks so awesome. If you feel like being nice, you can tell them how easy this project was. Totally doable, right?? And if you are debating between painting the surround and replacing it, like Christy, you don’t have anything to lose by giving painting a try before you spend a bunch of money replacing the surround – that simple $5 can of spray paint will probably do the trick!! Have any of you tried this project? Got any projects that you’d like to tackle but need some advice? Fire away!! You can leave your question in the comments or shoot me an email here. And by the way – see that fab mantle above Christy’s fireplace? And the beautiful hearth? Christy and her husband made the mantle from scratch, and Christy’s husband and dad tiled the hearth. Skills, I tell you!! How awesome is that?? 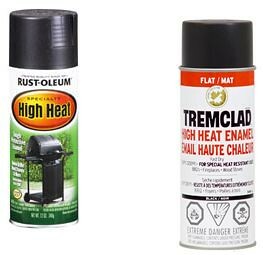 Images courtesy of Rustoleum. This post is shared with Hooked on Houses. 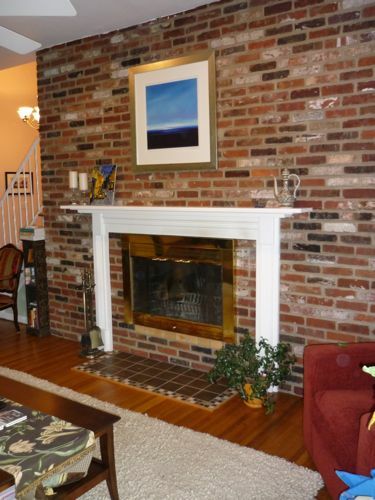 I love the brick on your fireplace, and I think Liz’s suggestion is going to make it stunning! Can’t wait for the after picture! I would just add a couple more steps — clean the brass with TSP, give it a quick sanding, and then wipe off any excess dust before painting. Everybody, the TSP that Kelly’s talking about is trisodium phosphate, a heavy duty cleaner that can take off any soot or grime that might have built up on the fireplace surround. And if your fireplace gets a lot of action, sanding the surround will make it a little easier for the spray paint to stick to the shiny brass. I can’t wait to see the makeover!